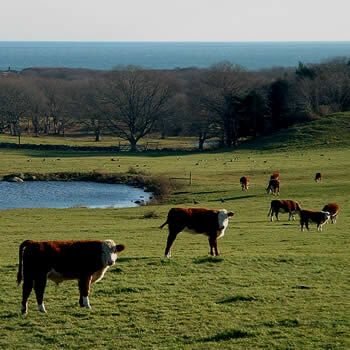 However, more than 40% of the open space we take for granted on the Vineyard could be developed. Favorite vistas could be blocked, wild stretches of tree-canopied rural roads could become rows of houses with front lawns, and farm fields could become subdivisions. Over time, areas of open land still large enough to support a rich population of plants and animals could become so fragmented – with a road here, a house and lawn there – as to threaten their biodiversity, and especially the survival of rare species. We need to better protect the remaining open spaces, vistas, farms, and habitat; we can also go a long way towards restoring areas that have been compromised. This section includes several subtopics. Open Space Protection: protecting open space and strengthening the culture of stewardship on the Island. Biodiversity and Habitat: conserving the viable populations of native species within the Island’s ecosystems, crucial for the health of the system. Recreation in Nature: providing for enjoyment of nature in a manner that refreshes the mind, body and spirit. Natural Character: preserving landscapes and scenic vistas provided by nature. Agriculture: using land for farming.